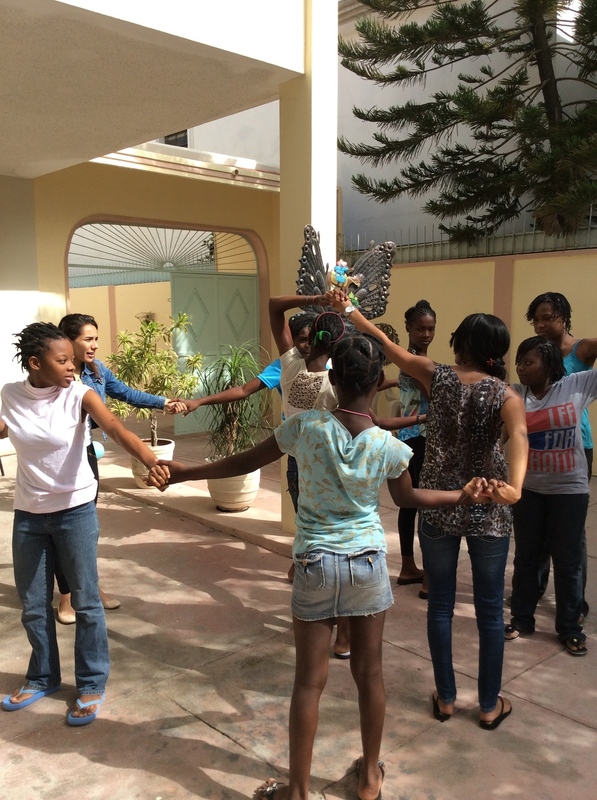 In the summer of 2014, Shout Mouse Press traveled to Haiti to partner with the Restavek Freedom Foundation. Restavek--which in Creole means 'to stay with'--is a term for exploited children working as unpaid domestic laborers. The system of restavek is part of a deeply-embedded Haitian tradition designed to help poor families: in principle, children are sent to live with wealthier others to be treated like family and enrolled in school in exchange for small services. But in reality, children are often forced to work as domestic servants, performing menial tasks for no pay. They are rarely provided opportunities for education and are often emotionally or physically abused. According to RFF, the system of restavek affects one in every fifteen children in Haiti and is a form of modern-day slavery. Restavek Freedom's mission is simple: to end child slavery in Haiti in our lifetime. RFF advocates for children by providing educational opportunities for those in restavek; influences communities to help change cultural norms regarding restavek; and mobilizes community leaders to stand up for freedom. Get the complete collection of all Shout Mouse Press books for children and teens! Get both Restavek Freedom Foundation children's books. Written by a team of young women served by the Restavek Freedom Foundation, these books aim to raise awareness about the inhumanity and injustice of child slavery in Haiti in a way that is accessible and suitable for young readers. These stories give young readers a chance to think about dignity and equality and to talk about ways of standing up for what's right. At the same time, the books give these authors the opportunity to shape the stories of their own lives with power and possibility and hope. On Wednesday, August 12th, we had the incredible opportunity to meet leaders working with at-risk youth from all over the world and to share with them our books! Through a program called the IVLP which is run by the State Department, we met with folks from: Armenia, Australia, Bangladesh, Belize, Congo, Egypt, Haiti, Iraq, Jordan, Kenya, Malaysia, Mexico, Pakistan, Palestine, the Philippines, Portugal, Sri Lanka, Trinidad and Tobago, and Ukraine. Shout of the Day goes to End Slavery Now for highlighting the important work of the Restavek Freedom Foundation writers! "Telling our kids about the bad things happening in the world is a tough task. Restavek Freedom Foundation is helping to make that conversation easier with their children's books written by former child slaves." Every Shout Mouse Book in EVERY DCPS School! We're not just shouting today at Shout Mouse, we're doing a little jig. Why, you ask? Because in partnership with the good folks at Reach, Inc. we just delivered nearly 1,000 Shout Mouse and Reach teen-authored books to DCPS Libraries, who want every one of our titles in every one of their schools. Every Shout Mouse book in every public school in DC. !! !